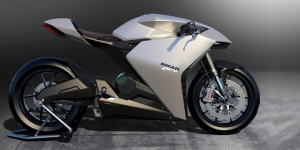 Italian motorcycle manufacturer Ducati will be producing electric motorbikes in serial production. Speaking at a Motostundent event in Spain, Ducati CEO, Claudio Domenicali, said development had advanced to a close to series version already. “The future is electric, we’re not far from starting series production,” said the Ducati boss but without adding further detail. While Ducati has yet to produce electric motorcycles, they have produced multiple electric bicycles in partnership with other companies. The company also previously worked with the Milan Polytechnic School of Design to develop an electric Ducati concept, the Ducati Zero. While Ducati makes its foray into electrifying their iconic motorcycle brand, they are not alone. Up-market electric motorcycle fans are already being catered to with the LiveWire from Harley Davidson and a German piece of futuristic design in two-wheelers with the Novus. Those wanting to spend a fortune on an electric two-wheeled rocket can also try the Arc Vector backed by Jaguar.